Join the discussion on our forums! 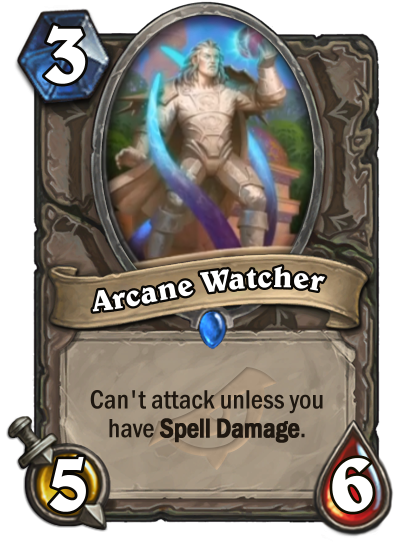 Come discuss Arcane Watcher over in our dedicated Arcane Watcher discussion topic. Can't attack unless you have Spell Damage. Now his watch has ended… until you have Spell Damage. From the look of the statue, it looks like Rhonin is back, only this time you have to silence him. Mana Reservoir into this and you have a pretty good control setup. Ah, this brings back memories of another such oldie. I must say. With all the silence effects coming up along side some various spelldamage. This seems to be a rather good card. Eventhough if you can't attack your opponent more than likely need to do something about it being there. Also, lets not forget about "add taunt" effects as well.